On April 28th 1940 HMS Firedrake witnessed one of the worst tragedies of the war. They were at lunch in the wardroom under orders to proceed shortly to sea, when they heard a terrific explosion quite near. The first officer to get on deck found that the ship next to them the big French destroyer the Maillé Brézé, lying at anchor two and a half cables from them, had, by the supreme misfortune torpedoed herself. 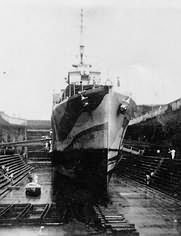 She was a ship of more than 2.400 tons, almost a light cruiser, one of the heavy destroyers of the " Aigle " class. Her torpedo tubes were not in line, but staggered on either side of the ship. They were trained fore and aft in the normal rest position, and by some almost incredible accident one of them had fired. The safety mechanism had failed and torpedo had slithered along the main deck, hitting the break of the fo'c'sle under the bridge structure. The explosion which they had heard in the wardroom had wrecked the whole forepart of the ship, and set fire to the fuel oil and everything combustible and ultimately, the forward magazine. Many men were killed by the first violent explosion. But many others were trapped because the entrance and exits to the mess-decks were just a mass of bent and twisted steel engulfed in flames. On the Firedrake there was not a moments hesitation. Both the whalers were in the water almost before the first shock of the explosion had died away. The First Lieutenant took one, and the Sub, the Doctor and the coxswain took the other. There were men on the deck of the fo'c'sle of the Maillé Brézé so one whaler went to the bow to take them off. Fifteen men slid down the hawse pipe and were taken away to safety. The Doctor's boat went alongside amidships, and the coxswain, Peter Armstrong hurled the medical chest in one tremendous heave from the whaler to the deck. They then went aboard. There were dead and dying every where, what emergency treatment could be done, was done there and then. The First Lieutenant's boat took the survivors to the Firedrake and came back with every portable fire-fighting appliance on the ship, they took with them smoke helmets and other rescue gear. The fire had not yet taken hold, there was still a chance of saving the ship. They began to fight the fire, and all this time there was the probability that the whole ship would blow up if the fire reached the magazines. They worked desperately, helping terribly mangled men at one end of the ship, and fighting the fire at the other. But the flames gained on them, and with the brutal swiftness of an oil fuel blaze, it became clear that the men trapped in the mess-deck were doomed. Help came, and other boats came after them, but the crisis developed in a rapidity beyond all control. They could see the men by the scuttles of the mess-decks thrusting their arms out. Those that they could, they helped with morphine from the boats alongside. The Maillé Brézé went down with thirty-eight still trapped below. Since that day escape hatches have been fitted in the mess-decks of all small ships. Top of the page: Is the ships Bell recovered in 1955 and kept at Saint-Mandrier. 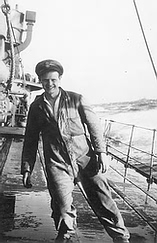 Photo Left: The Firedrake's coxswain Peter George Armstrong, who was awarded BEM for his action that day, in administering first aid to the injured and dying onboard the Maillé Brézé even though the ship was in danger of exploding at any moment. 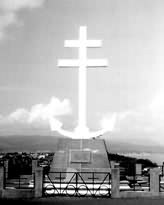 Photo Right: The memorial at Gourock, near Greenock on the Clyde, for the French sailors that lost there lives. Before the war Jack had served in the merchant navy with the Leyland Line, he once got shut in a large refrigerated hold full of fruit coming back from south America, but it wasn’t long before he was missed, and a search of the holds was started and he was released. Jack was married in August 1934 at the age of 28 to Winifred they later had a daughter Julie. When Jack was with the Leyland Line he once served onboard the Liner Winifredian a name very similar to his wife. Jack decided to join the Royal Navy after having some bouts of short time and having to sign on as unemployed. After joining the Royal Navy he was soon posted to the China station Wei-Hai-Wei on HMS Diana, there he had a pet monkey he used to call Jacko, he was very upset when it died after an accident with one of the steel hatch covers. Jack joined the Firedrake just before the outbreak of war in September 1939. He stayed with her right through till her loss in December 1942. Whenever the Firedrake was in for a repair or refit he would contact Winifred and she would travel to where the ship was, so they could spend some time together, she travelled to Cardiff, Greenock, the Clyde and even went to Londonderry so she could be with Jack. Jack once had his photo taken with Admiral Somerville, standing in the hole made in the starboard side of the Firedrake, by the Italian 500kilo bomb when on operation "Substance" in the Mediterranean in July 1941. When in Gibraltar the hole was packed with sand bags, and shored up with boards and timber so she could make the trip to Boston USA for the repairs to be carried out properly. Jack had the qualifications to become an officer but chose to say with his engines, he much preferred the engine room to the bridge. Winifred never remarried and still keeps photos of Jack on her dressing table at home in West Yorkshire. Winifred remembers having tea in a tea shop in Greenock and meeting one of jacks friends from the ship, she said he came from the Isle of Man. That was Bob Clague also an ERA, later he was to be drafted to another ship so wasn't onboard when the Firedrake was sunk in 1942. Bob was later awarded the DSM for the work he did on the Firedrake's engines, after the Italian bomb that had blasted a great hole in her side and had stopped them. Together with Jack Wallbank, the Engineering officer Terence Ridley and others they managed to finally get the Firedrake moving under her own steam again. It had taken nearly 48 hrs, even though she had been towed a lot of the time by the Hunt Class destroyer Eridge, for 36 hrs they were less than a 100 miles from the Italian base of Cagliari, very much in range of the Italian air force. They finally got the Firedrake into a dry dock at Gibraltar and could now see just how bad the damage really was.